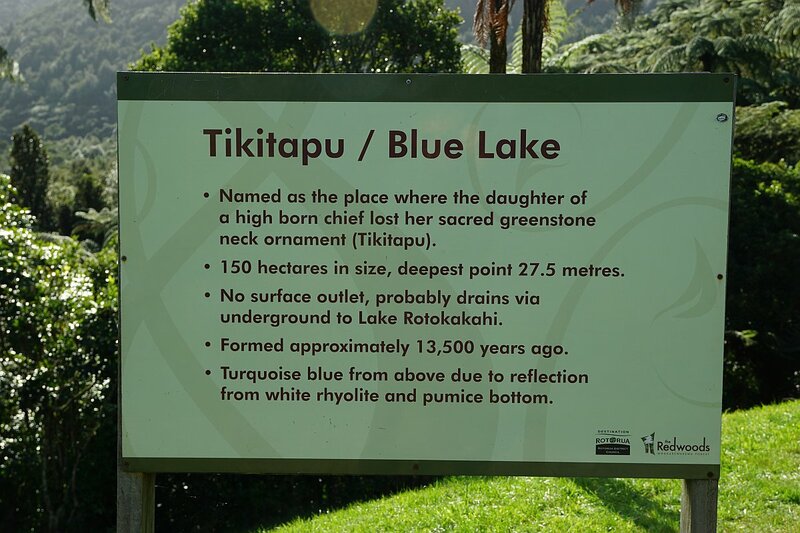 Lake Tikitapu or Blue Lake is situated in the Lake Tikitapu Scenic Reserve, alongside Tarawera Road and the Whakarewarewa Forest, a few kilometres south of Rotorua. 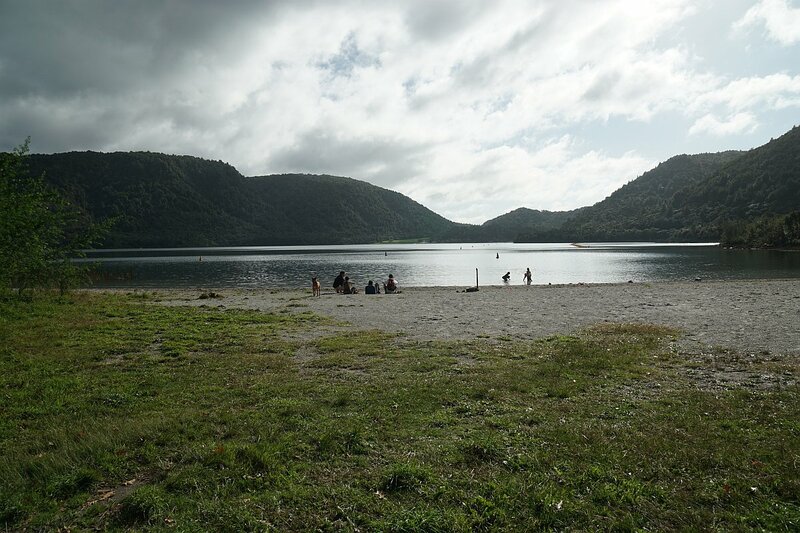 The lake is used for various watersports and together with the area around it for competitions such as triathlons. 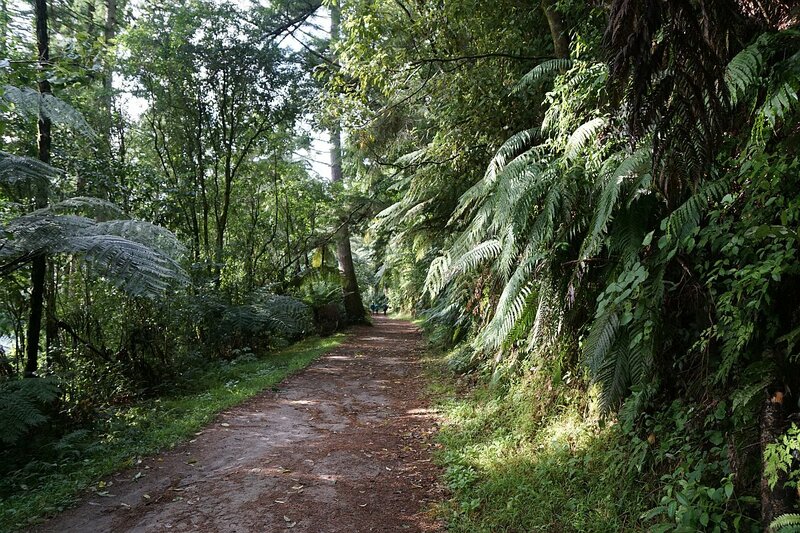 A walkway of close to 6 kilometres in length runs all the way around the lake. 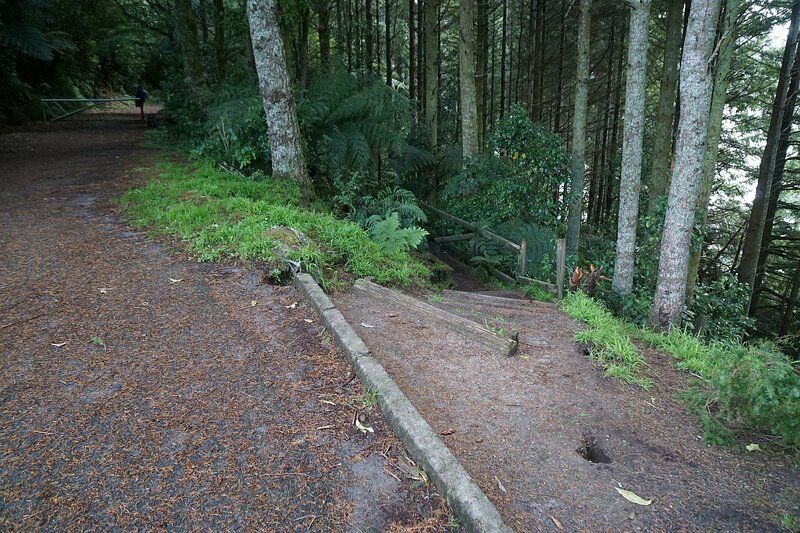 The walkway is well formed, and has no steep sections and only a few steps. Alternative tracks are available to bypass the steps. 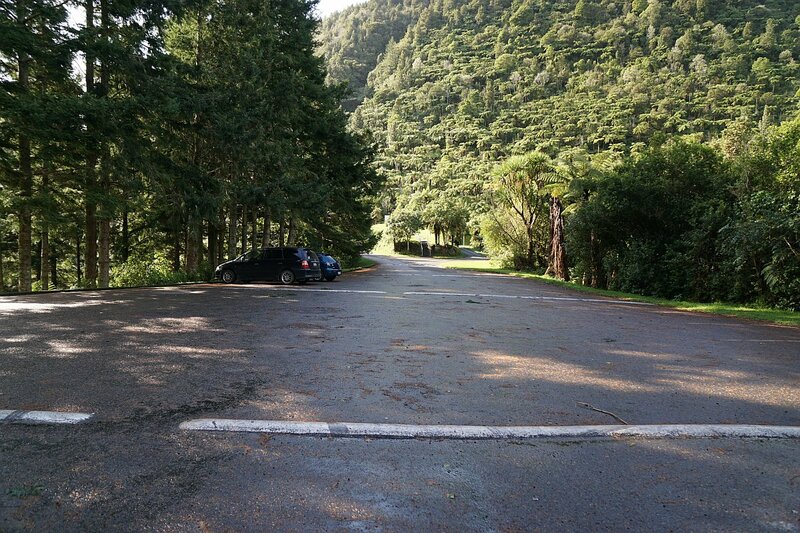 Parking is available directly off Tarawera Road across from the holiday park, near the Okareka Loop Road intersection. Another parking area is also available near the water ski clubhouse, at the northern end of the lake. Toilet facilities are available nearby, but some of them are closed during winter months. Information about the track around the lake is available on the DoC web site. 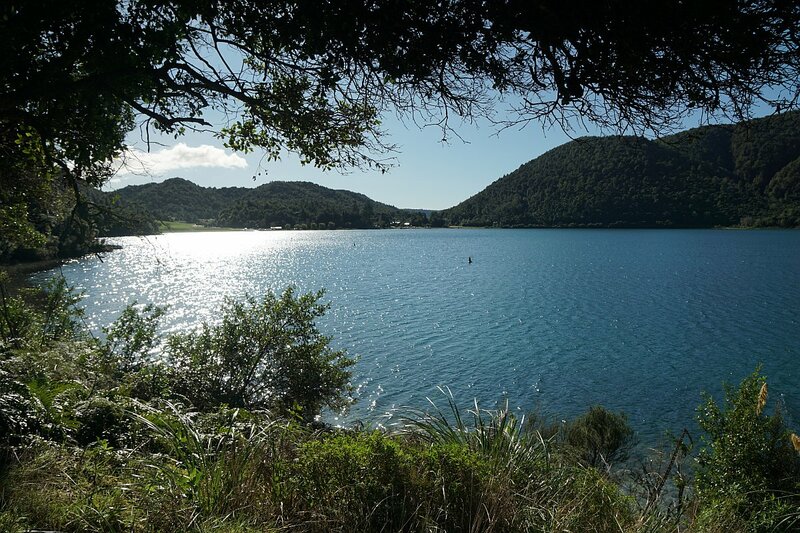 Swimming is permitted in some parts of the lake, and dogs on a leash are allowed on the walking track. 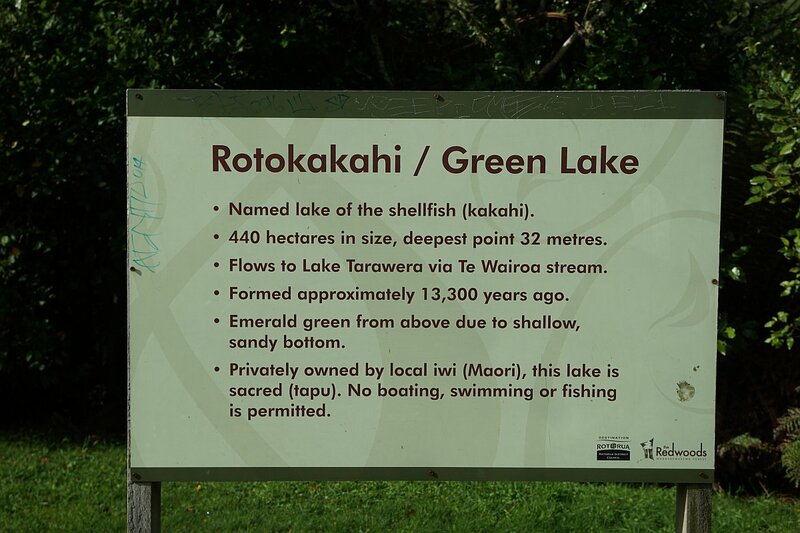 The nearby Lake Rotokakahi or Green Lake is visible from the lookout between the two lakes, but is privately owned with no public access. The track can be walked either clockwise or anti-clockwise, but is only signposted in a clockwise direction. The following description and photos are from an anti-clockwise walk. At the southwestern end of the lake there are a two alternative routes that can be taken. 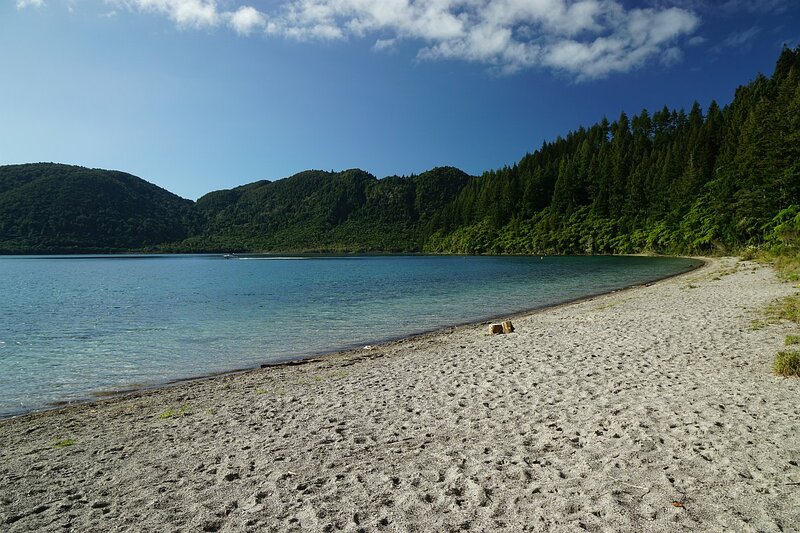 One leads down to a secluded sandy beach on a steeper and narrower track, and the other is a wider track with a more gentle gradient. Both of these tracks were walked on this occasion. Total track length is about 6 km, using only one of the alternative tracks, and took close to 1 hour and 30 minutes. 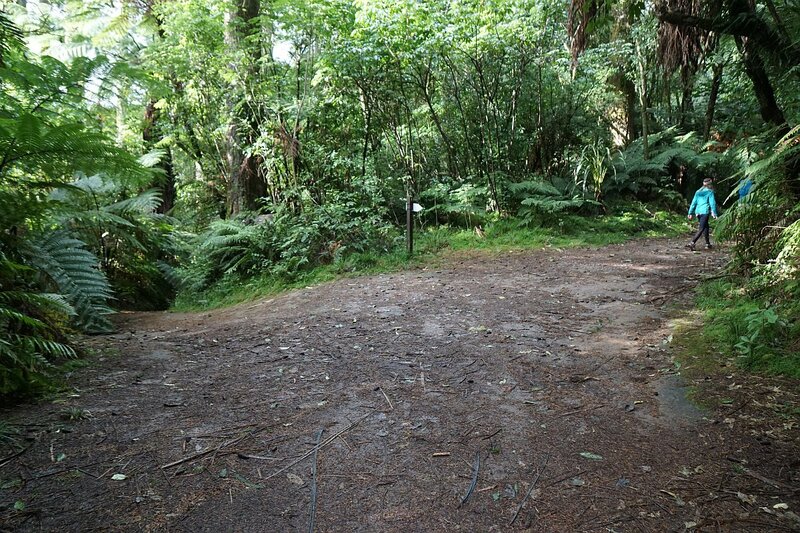 There is a height difference of about 35 metres between the lowest (by the lake edge) and highest (by the lookout) parts of the track. 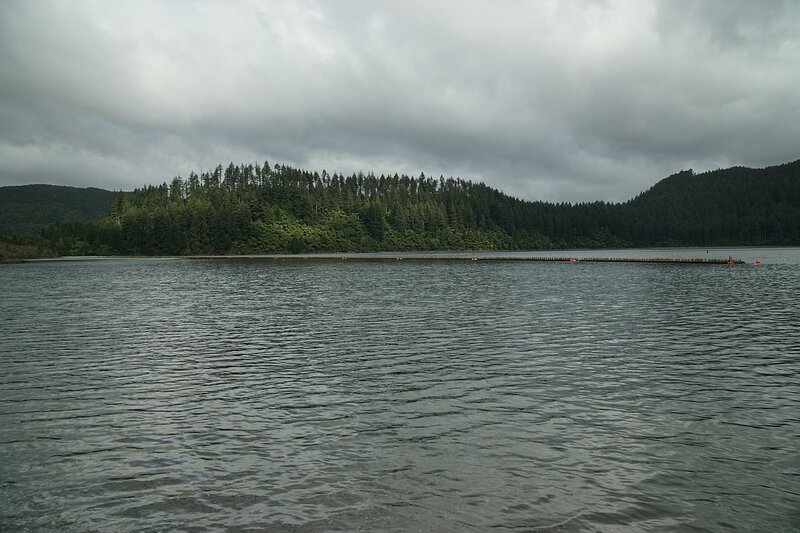 There are no streams to cross as the lake has no known inlets or outlets. 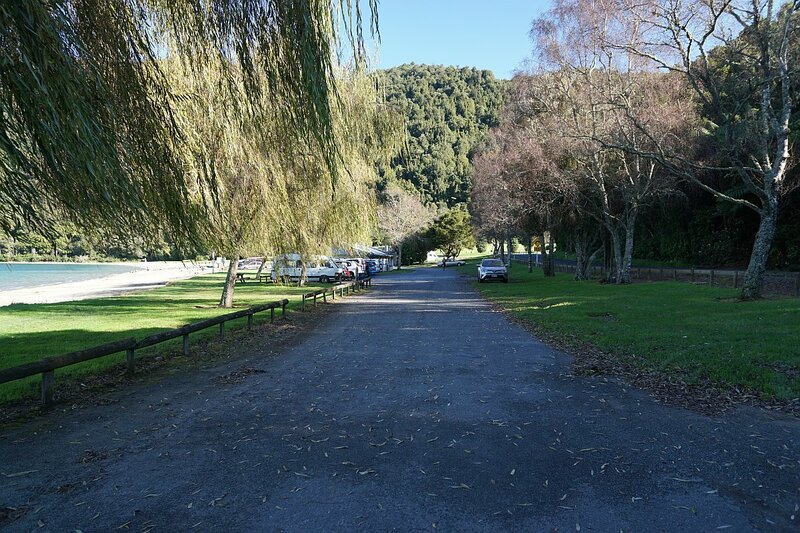 The parking area on Tarawera Road, with the holiday park on the left. Looking from near the parking area towards the club house and the parking areas nearby. A recreational and viewing area for swimming and boating events near the boat ramp and club house. The track around the lake enters the forested area near the far left edge of the photo. 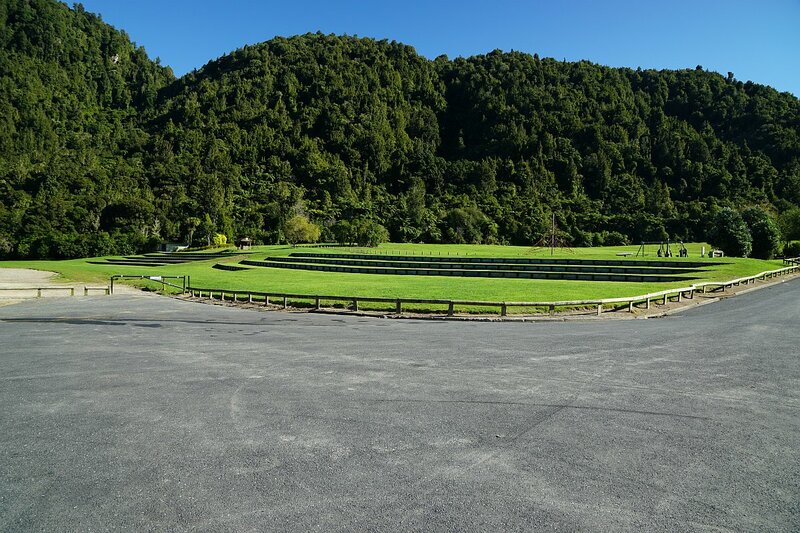 The track entry/exit by the recreational area. It recommends walking the track in the clockwise direction. View from the track across the lake towards the southeastern end. View from the track towards the northern end of the lake, with the recreational area, boat club, parking area, and holiday park visible by the lake edge. 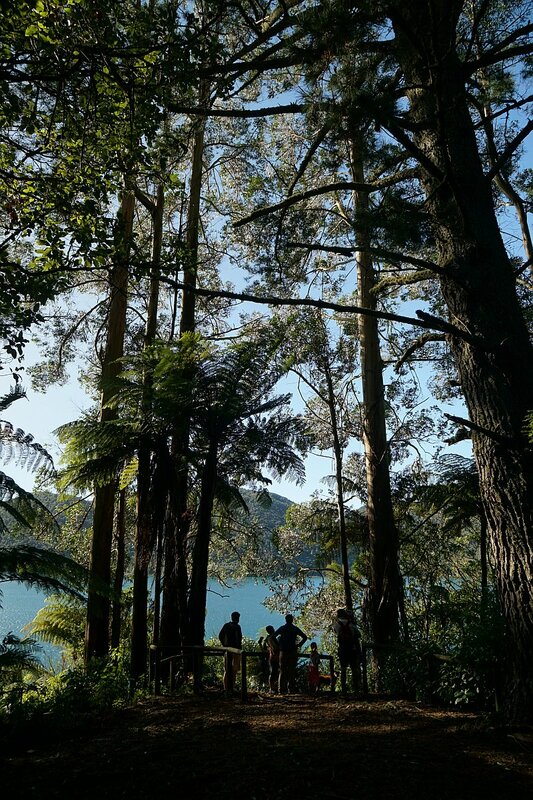 A lake lookout with some tall eucalyptus trees and a large pine. 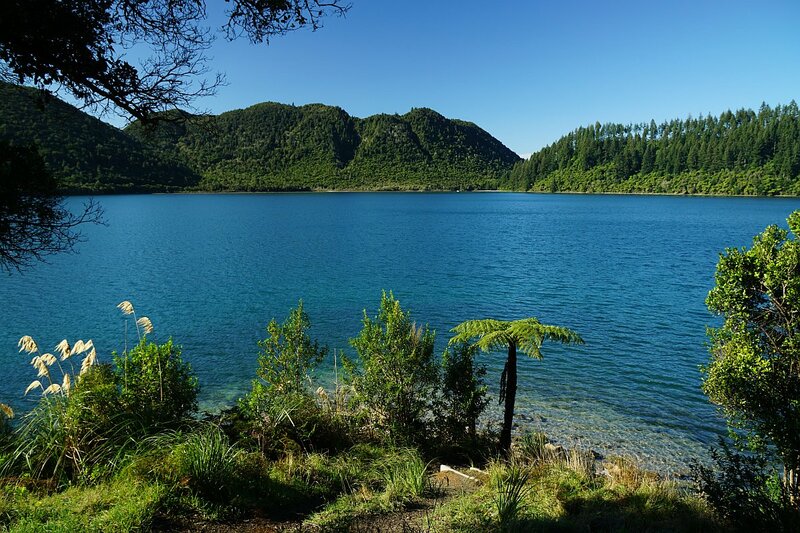 The western edge of the lake adjoins the Whakarewarewa Forest, with stands of fir and pine trees and a few eucalyptus trees. The track to the left is an alternative track, leading past a secluded sandy beach, and back up to the main track which can be seen on the right. The beach accessible from the alternative track. The alternative track zig-zags back up to join the main track. The joining point, with the alternative track down to the lake on the right. 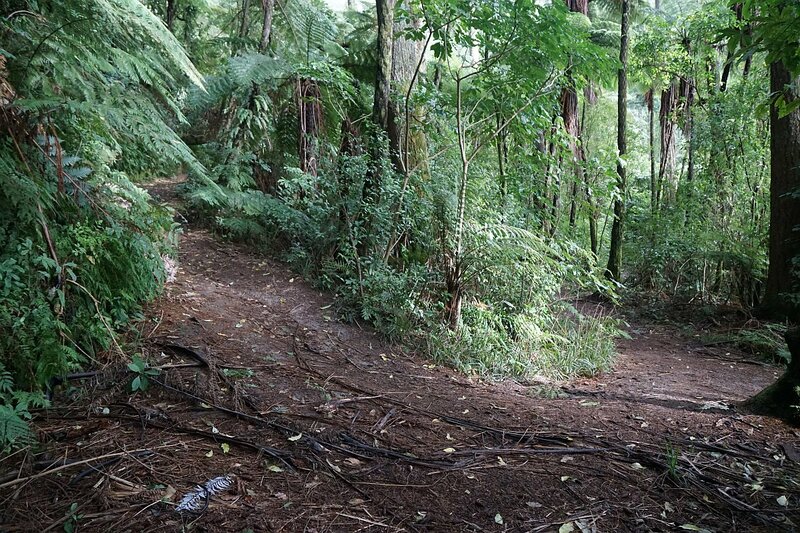 The main track, between the two ends of the alternative track, has a junction with various mountain bike tracks and walking tracks. 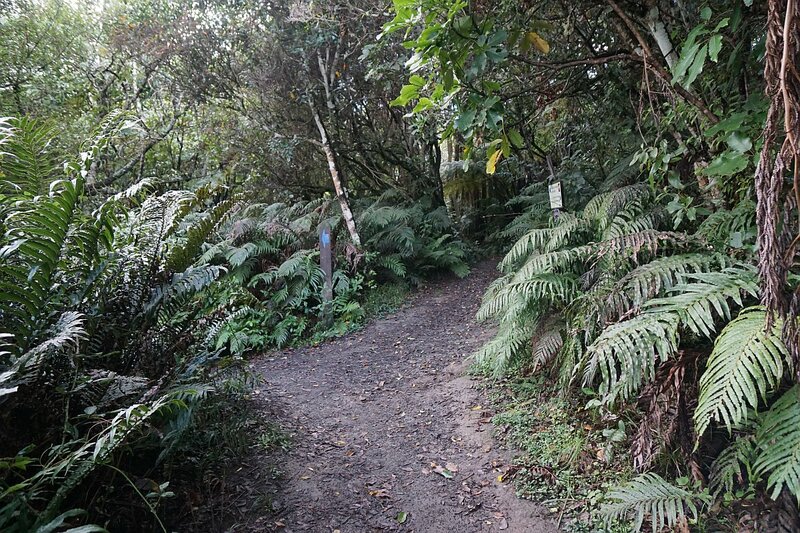 The main track around Tikitapu curves around to the right. 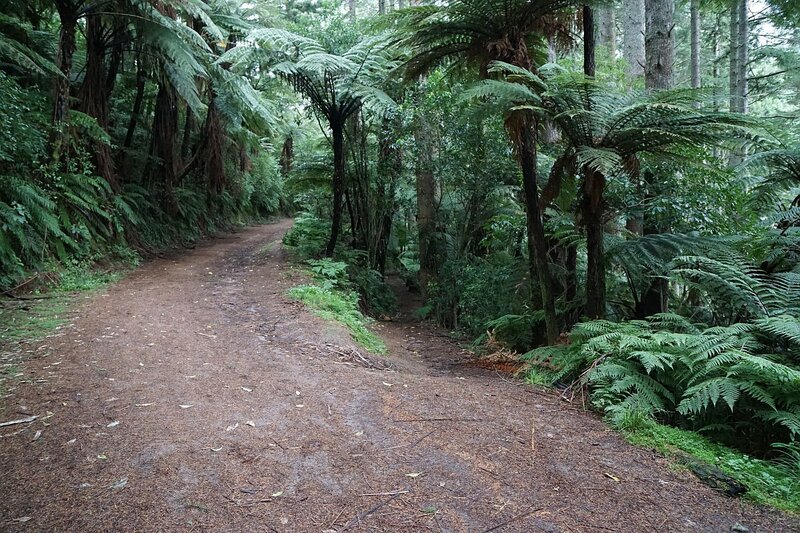 Heading along the main track towards the lookout between Tikitapu and Rotokakahi. 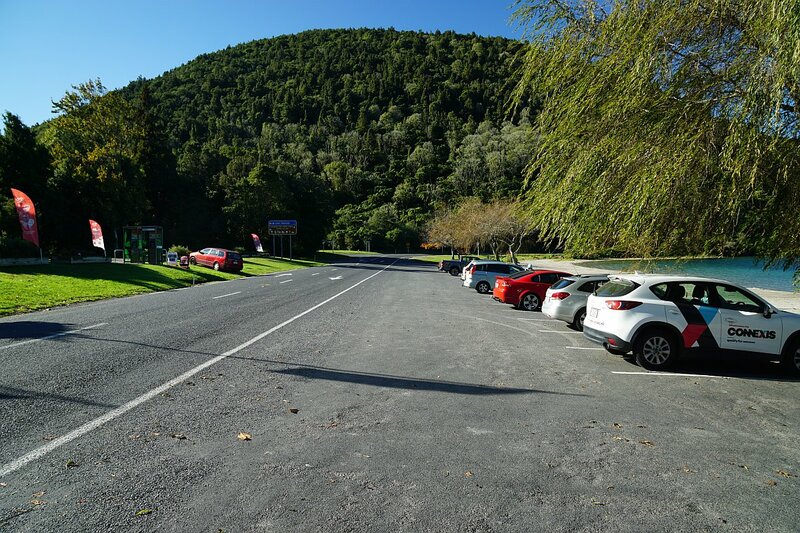 The parking area by the lookout. The lookout is on the small rise between the two branches of the access road. 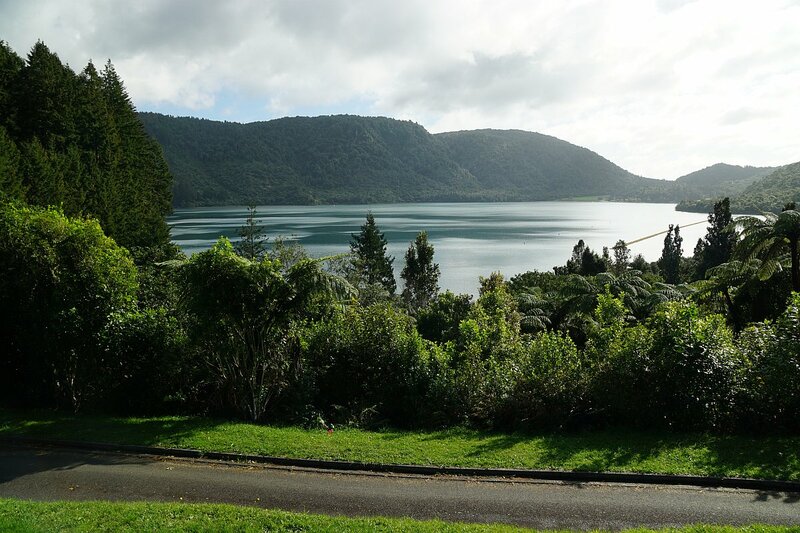 View across Tikitapu/Blue Lake from the lookout. A 500 metre long floating wetland barrier constructed to calm the waters for slalom waterskiing can be seen on the right. An interesting description of the barrier and its construction can be found on the Kauri Park Nurseries web site. View across Rotokakahi/Green Lake from the lookout. Information panels at the lookout. 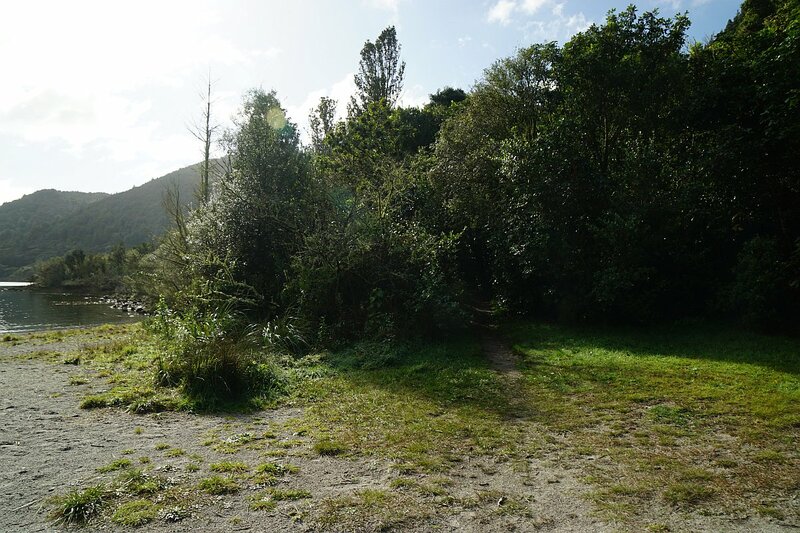 A path alongside Tarawera Road can be followed from the lookout back to the parking area at the northern end of the lake. 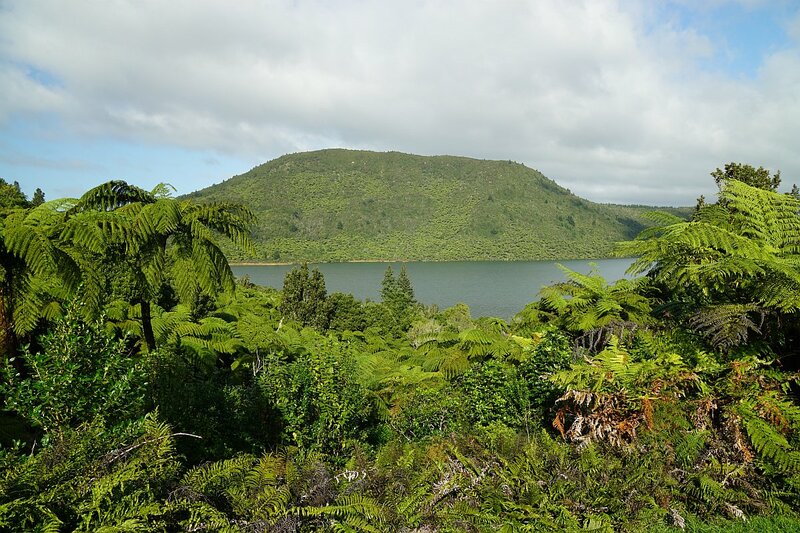 A more interesting track leads from the lookout parking area down to a sandy beach, and then through vegetation until it joins up with Tarawera Road a few hundred metres from the parking area at the north end of the lake. The track leads down the steps to the right. The sandy beach at the bottom of the steps leading down from the lookout carpark. 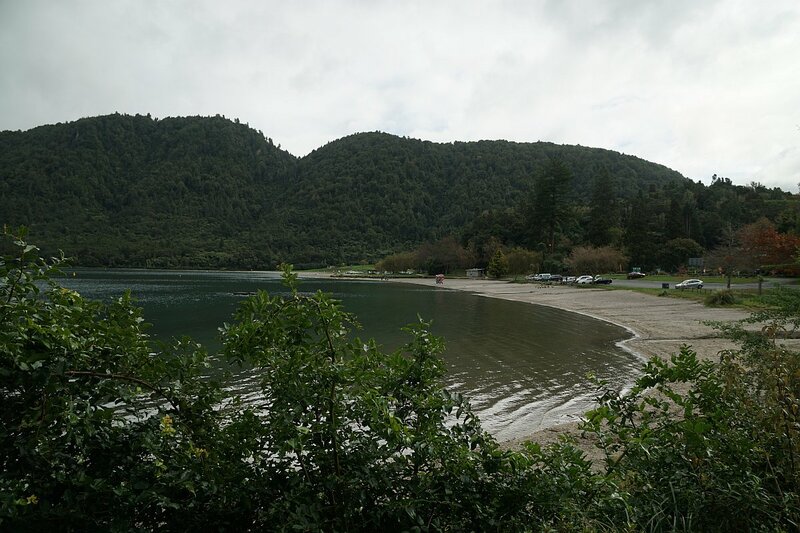 From the beach the track running parallel to Tarawera Rd enters the bush area on the right. 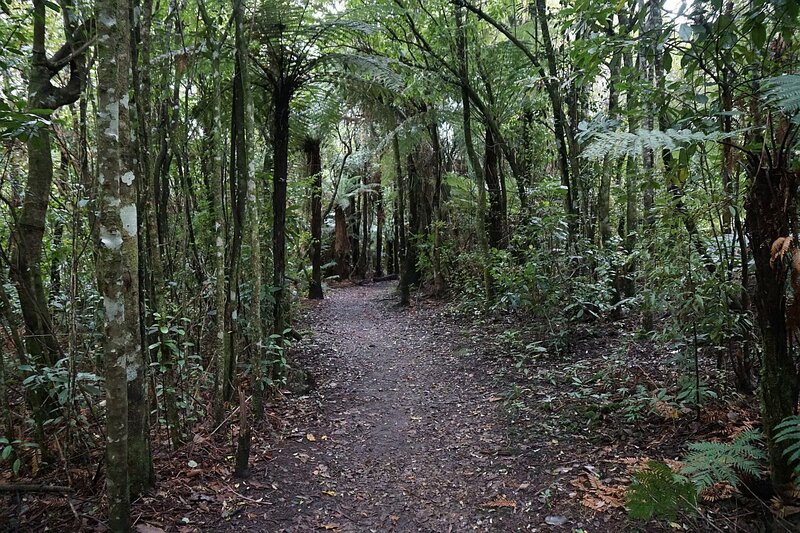 The track is partly overgrown in places, and runs very close to Tarawera Rd with the track to the right leading up to Tarawera Rd. The northern end of the floating wetland barrier. 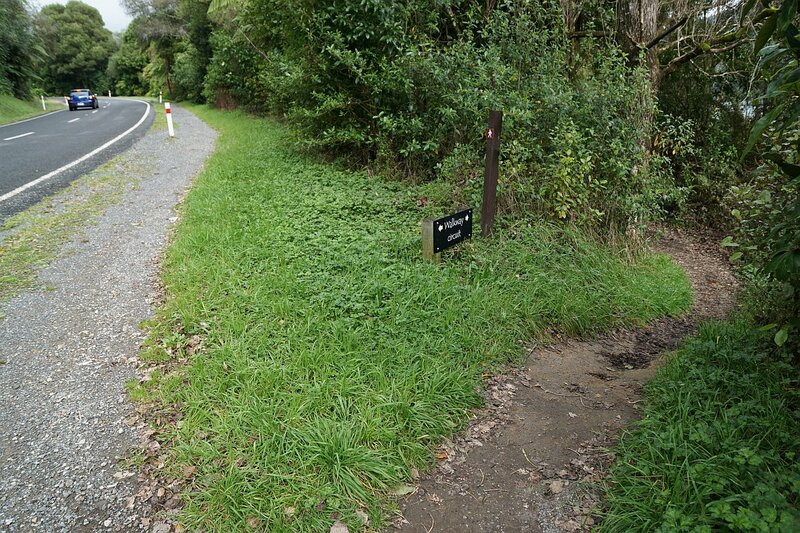 Tarawera Road is only a few metres from the track, and is visible through the trees on the right. 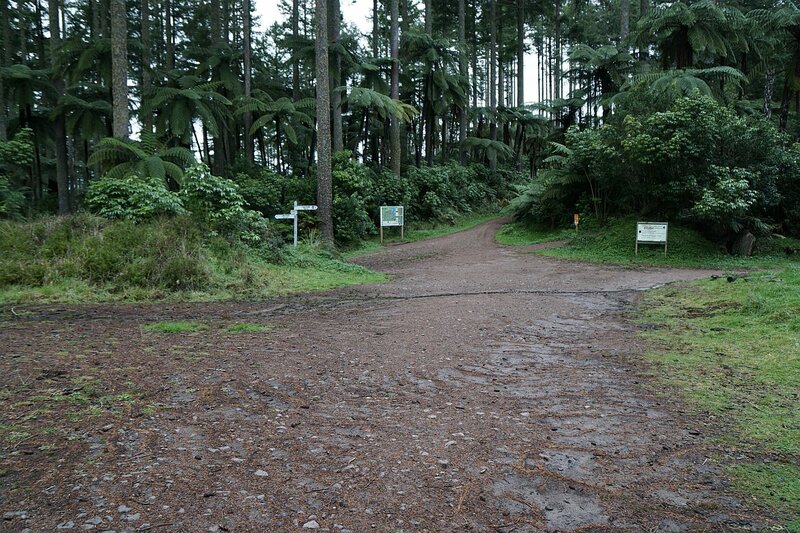 The track joins up with Tarawera Rd, with a path alongside the road leading back to the carpark. Looking from the path as it approaches the carpark. 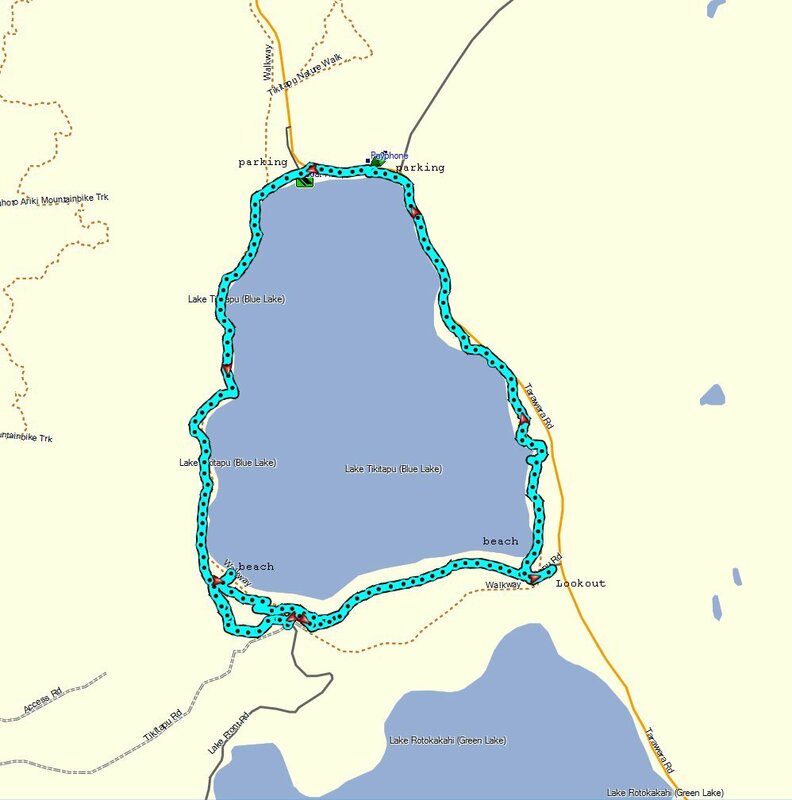 The GPS tracklog shows the route followed, including the two alternative tracks at the southwestern corner of the lake. The lookout, beaches, and parking areas are marked. The total distance walked was 7.6 km with a time of 1 hour 50 minutes, but that included walking both of the alternative tracks, one of them in both directions. Using just one of the tracks would give a total distance of about 6 km, with a time of 1 hour 30 minutes (beach track) or 1 hour 25 minutes (main track). 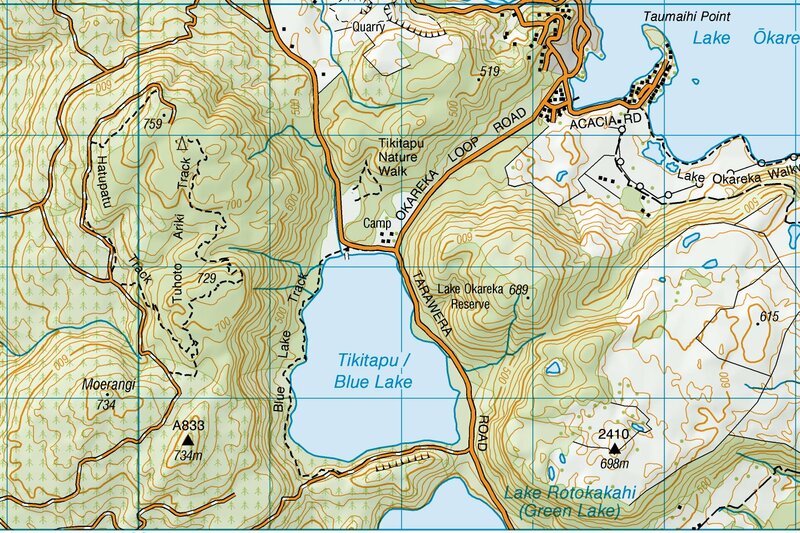 The topographic map excerpt shows a slightly larger area around the lake. 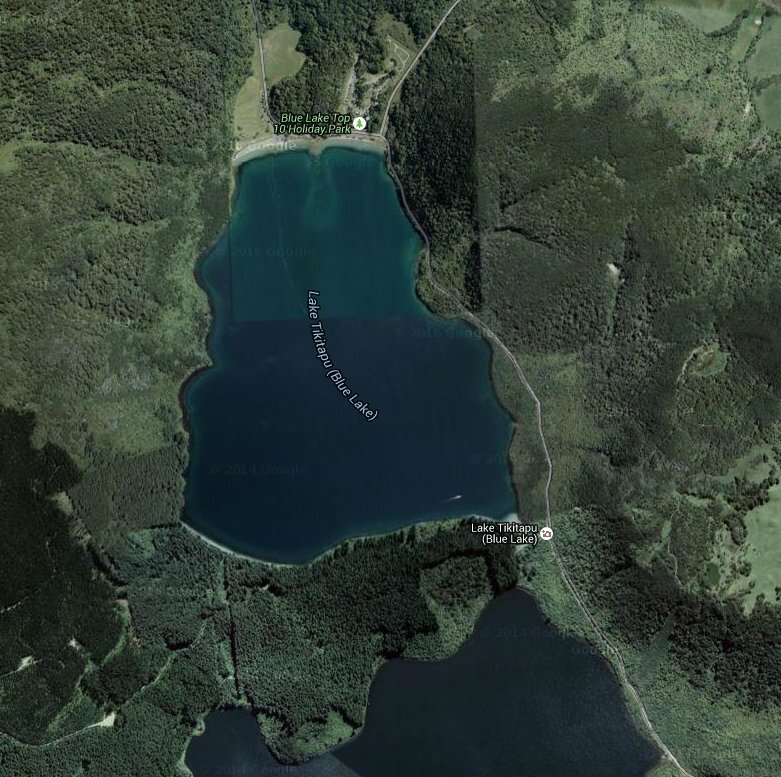 The satellite image of the area is taken from Google Maps, and shows the lake before the floating wetland barrier was constructed. The track was walked on May 22, 2016 and on several previous occasions. 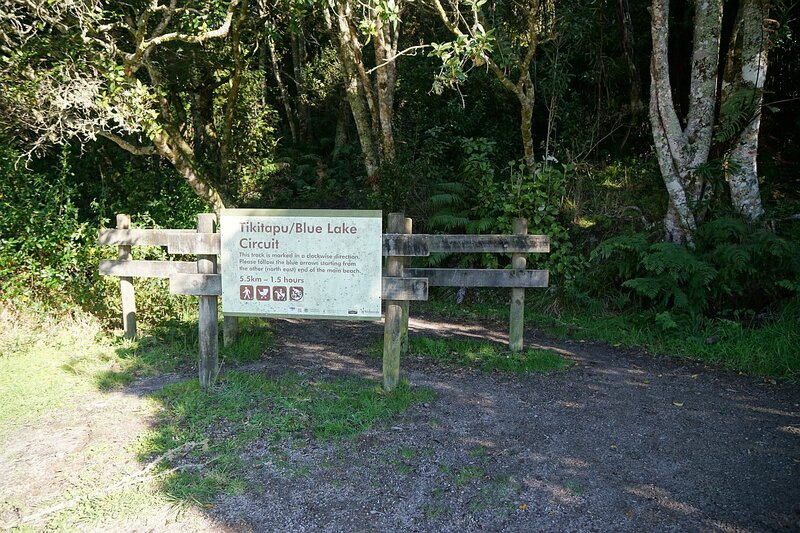 This entry was posted in Walks and tagged Blue Lake, Lake Tikitapu, Lake Tikitapu Scenic Reserve, Rotorua, Whakarewarewa Forest on 2016-05-23 by nzartig.